If the summer weather starts to cloud up and the children are getting restless, there's no better time to host an indoor beach party. Getting in a tropical state of mind will lighten the load even if it looks like there's a hurricane brewing outside, and a good party will get everyone's juices flowing! Who says you can't have fun in the sun when it's raining outside? Depending on your children's age, the type of invitation you have will differ. Encourage them to get involved and make as many suggestions as possible. Message in a bottle with the invitation inside. Folded palm trees with the information written inside drawn coconuts. Write the invitation on a beachball that's deflated. Your guests will have to blow it up to find out all the necessary info. On the invitation, tell guests you are having a beach/tropical theme. Suggest they wear either swimming costumes, tropical shirts, hula skirts, pirate's or mermaid's outfits or whatever takes their fancy. They can also bring buckets and spades, beach towels, inflatable toys etc to add to the fun. The success of the party will depend, in part, on how involved your guests become. Encourage them to take it seriously, putting suncream on their noses, dressing in flip-flops instead of Wellies, and wearing a set of funky shades and hot pink or blue beach hats and armbands. It's all in the detail. 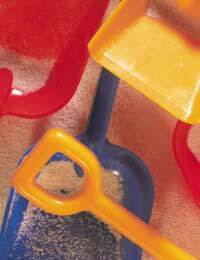 Anything goes with an Indoor Beach Party, which is why they are so fun – and easy – to organise. Bring out your lawn chairs, your beach umbrellas, colourful beach towels and any beach posters you may have, or can find cheap at a travel agent's. If you want to go with a Hawaiian theme, or a luau, many party shops sell fishnets, leis (wreaths of flowers), hula skirts, tiki curtains etc. You may also want to invest in balloons that are brightly coloured and make your own tropical flower displays, or buy tropical flip flops, inflatable palm trees, luau palm tree stirrers etc. Remember that the party can be as lavish as you want – or you can make it plain and simple, with the children colouring in most of the decorations for you. For young children who expect a party bag, go with either a beach or Under the Sea theme. Seashells, plastic sea creatures, notebooks with sea animals on the front and sea-themed pens and pencils will all go down a treat. This is an easy one – just pretend you're at the beach. Hamburgers and hot dogs, cold drinks in bright coolers placed around the room, potato salad and ice lollies. Need we say more? Decorate the food with brightly coloured paper parasols and buy bright paper napkins and plastic cutlery. Food can be arranged on picnic or beach blankets, and younger children will delight in sarnies cut out with sea-creature and starfish biscuit cutters. If you can stomach it, serve salads in brand new (and washed) buckets, and use plastic spades as serving spoons. Keep everyone in a beach party mood by playing loads of beach-themed music, such as The Beach Boys, Elvis in Hawaii, and Surfin' USA. Younger kids may not get the reference, but they'll love the music! Hoola Hoop contest. With gag gifts for the winners. Beach Blanket Bingo. Spread out the beach blankets and have guests play bingo, with the famous Frankie Avalon film playing in the background. You might also want to get in Gidget Goes Hawaiian, which older kids will love. Seashell Scavenger Hunt. Hide all sorts of fun seaside treasures around your home, such as seashells, dried starfish, pirates' eyepatches etc. Sand Painting. Spread glue on paper, sprinkle with coloured sand, then glue on seashells etc. Great for younger children. Indoor Volleyball. Move items out of the way to avoid breakage and bring in the inflatable beachballs! Pinata. Buy one in the shape of a seahorse or Hawaiian dancer. Look online for deals. Hosting a beach party on a dark, dismal summer day can be a breath of fresh air – and is, literally, a breeze. Choose a day that is expected to be gray – if you can believe the meteorologists – as everyone will appreciate your party even more. And if parents are invited as well, don't forget the Pina Coladas!